I started school in Jan 1935, this was to Nash Mills a small Church of England School, situated about 1½ miles from my home. Built in 1847 by John Dickinson for the children of his work people and villagers, at a cost of £597. At that time ….it consisted of a house for the teacher…and one very large school room and a smaller one. Approx. 40 pupils attended. 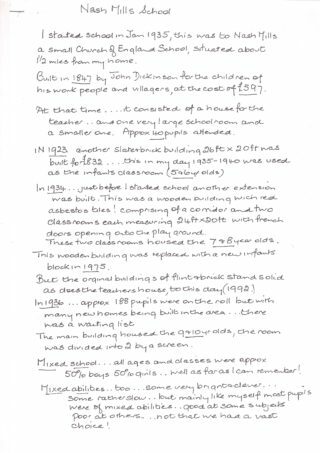 In 1923 another slate & brick building 26ft X 20ft was built for £832…this in my day 1935-1940 was used as the infants classroom (5 to 6yr. olds). 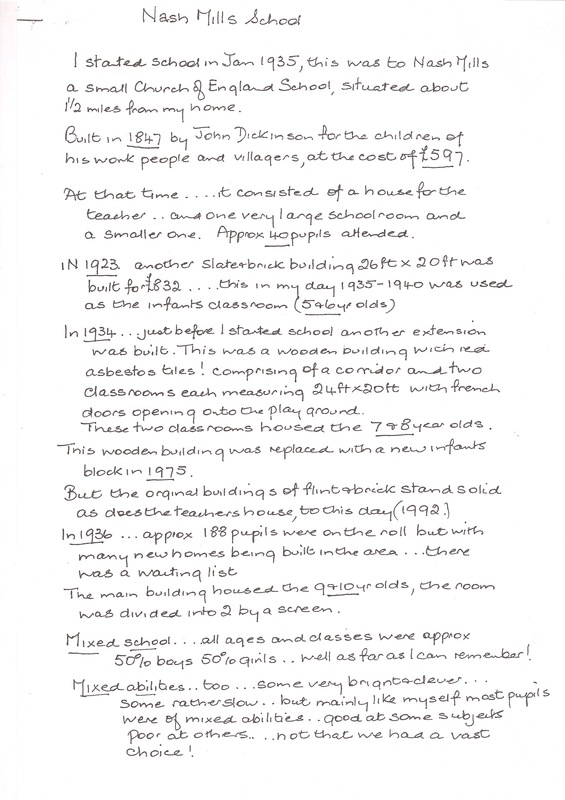 In 1934 …just before I started school another extension was built. This was a wooden building with red asbestos tiles! comprising of a corridor and two classrooms each measuring 24ft X 20ft with french doors opening onto the play ground, These two classrooms housed the 7 to 8yr. olds. This wooden building was replaced with a new infants block in 1975. But the orginal buildings of flint & brick stand solid as does the teachers house, to this day(1992). In 1936… .approx. 188 pupils were on the roll but with many new homes being built in the area…there was a waiting list. The main building housed the 9 & 10yr. olds, the room was divided into 2 by a screen. Mixed school … all ages and classes were approx. 50% boys 50% girls…well as far as I can remember. 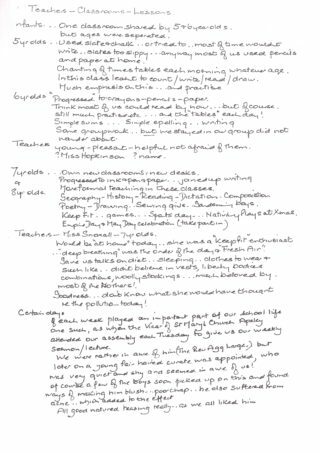 Mixed abilities …too… some bright & clever…some rather slow…but mainly like myself most pupils were mixed abilities…good at some subjects poor at others…not that we had a vast choice! Infants… one classroom shared by 5 & 6 year old, but ages were separated. 5yr. 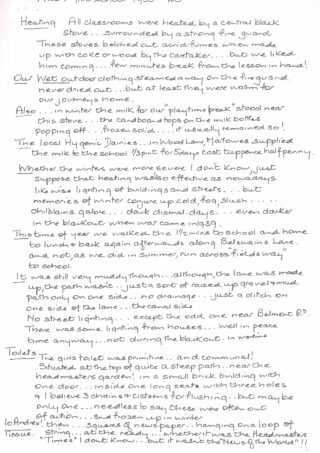 olds…used slate & chalk…or tried to…most of time wouldn’t write…slates too slippy…anyway most of us used pencils & paper at home. Chanting of times tables each morning whatever age. In this class leant to count/ write/ read/ draw. Much emphasis on this…and practice. 6yr. olds.. “Progressed” to crayons-pencils-paper. think most of us could read by now…but of course, still much practise etc…and the “tables” each day! Simple sums…Simple spelling…Writing. Some group work…but we stayed in our group did not wander about. Teachers. Young-pleasant-helpful not afraid of them. Miss Hopkinson…name. 7yr. olds. & 8yr. olds Own new classrooms & new desks. 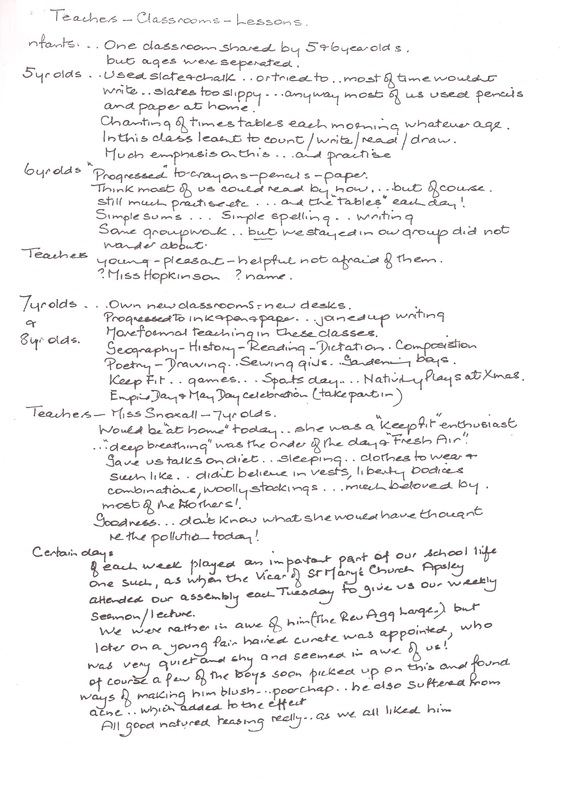 progressed to ink & pen & paper…joined up writing. More formal teaching in these classes. Geography- History-Reading- Dictation- Composition- Poetry- Drawing- sewing girls- Gardening boys. Keep Fit…games…sports day…Nativity Plays at Xmas. Empire Day & May Day celebrations (take part in). Teachers… Miss Snoxall-7yr. olds. Would be “at home” today… she was a “Keep fit” enthusiast…”deep breathing” was the order of the day & “Fresh Air” Gave us talks on diet…sleeping…clothes to wear & such like…didn’t believe in vests, liberty bodices combinations, woolly stocking…much beloved by most of the Mothers! Goodness…don’t know what she would have thought re the pollution today! Certain days.. of each week played an important part of our school life one such, as when the Vicar of St. Mary’s Church Apsley attended our assembly each Tuesday to give us our weekly sermon/lecture. We were rather in awe of him (The Rev. Agq Large.) but later on a young fair haired curate was appointed, who was very quiet and shy and seemed in awe of us! of course a few of the boys soon picked up on this and found ways of making him blush…poor chap…he also suffered from acne…which added to the effect. All good natured teasing really…as we all liked him. May Day… was celebrated each year…we had maypole dancing in the playground…a May Queen was chosen…Betty being chosen in 1935. the girls carried “May sticks” these were broom handles covered with moss, which held in place by bass, into which, flowers, leaves, ribbons were tucked…Very pretty they looked…even though many gardens looked bare afterwards! Empire Day… that we were told…was a very important day. 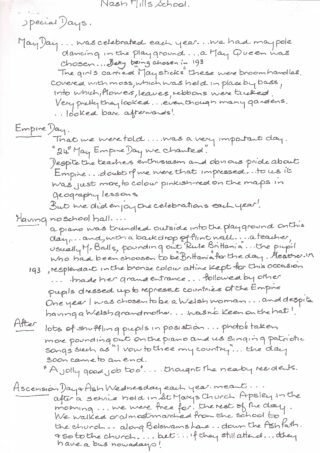 “24th May Empire Day we “chanted” Despite the teachers enthusiasm and obvious pride about Empire…doubt if we were that impressed…to us it was just more to colour pinkish-red on the maps in geography lessons. But we did enjoy the celebrations each year! Having no school hall… A piano was trundled outside into the playground on this day…and, with the backdrop of flint wall…a teacher usually Mr Balls, pounding out “Rule Britannia”…the pupil who had been chosen to be “Britannia” for the day Heather..in 1935. resplendent in bronze colour attire kept for this occasion…made her grand entrance…followed by other pupils dressed up to represent countries of the Empire. 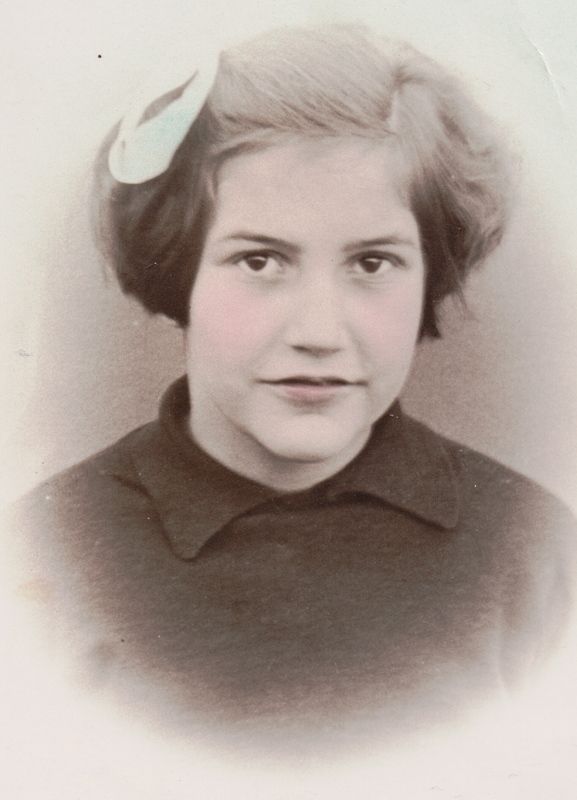 One year I was chosen to be a Welsh woman…and despite having a Welsh grandmother…wasn’t keen on the hat! After….. Lots of shuffling pupils in position…photo’s taken more pounding out on the piano and us singing patriotic songs such as “I vow to thee my country”…the day soon came to an end. “A jolly good job too”…thought the nearby residents. Ascension Day & Ash Wednesday each year, meant…After a service held in St, Mary’s Church Apsley. in the morning…we were free for the rest of the day. We walked or almost march from the school to the church…along Belswains Lane…down the Ash Path & so to the church…but…if they still attend…they have a bus nowadays! Heating… All classrooms were heated by a central black stove… surrounded by a strong fire guard. These stoves belched out acrid fumes when made up with coke or wood by the caretaker…but we liked him coming…few minutes break from lesson in hand! Our Wet outdoor clothing steamed away on the fireguard never dried out…but at least they were warm for our journeys home. Also….. in winter the milk for our “playtime break” stood near this stove…the cardboard tops on the milk bottles popping off…frozen solid…it usually remain so! The local Hygienic Dairies… in Wood Lane, Marlowes supplied the milk to the school, one third of pint for 5 days cost tuppence half penny. Whether.. the winters were more severe I don’t know, just suppose that heating wasn’t so effective as nowadays like wise lighting of buildings and streets…but memories of winter conjure up cold, fog,slush…chilblains galore…dark dismal days…even darker in the blackout when war came in 1939. 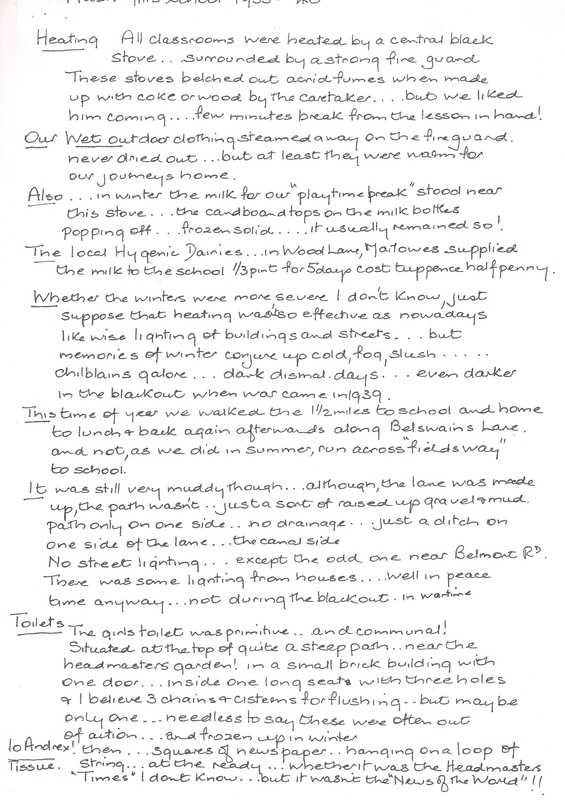 This time of year we walked the 1½ miles to school and home to lunch & back again afterwards along Belswains Lane and not, as we did in summer, run across “fields way” to school. It was still very muddy though…although, the Lane was made up, the path wasn’t…just a sort of raised up gravel & mud path only on one side…no drainage… just a ditch on one side of the lane.. the canal side…no street lighting…except the odd one near Belmont Rd. There was some lighting from houses…well in peace time anyway…not during the blackout…in wartime. Toilets… The girls toilet was primitive…and communal! Situated at the top of quite a steep path…near the headmasters garden, in a small brick building with one door…inside one long seats with three holes & I believe 3 chains & cisterns for flushing…but maybe only one…needless to say these were often out of action…and frozen up in winter. loo Andrex! Tissue then…Squares of newspaper…hanging on a loop of string…at the ready…whether it was the headmasters “Times” iI don’t know…but it wasn’t the “News of the World”! !